Image is for illustrative purposes only. The contents of your bag may not contain any of the silver rounds or bars shown here. Fine .999 silver at an incredibly low premium!! Are you looking for the very lowest prices on pure fine silver? This 100 oz .999 Fine Silver Grab Bag is made for YOU! Each Fine Silver Grab Bag contains 100 ounces of .999 pure fine silver. The bag may contain 1 oz, 2 oz, 5 oz or 10 oz silver rounds or bars, or a mixture of two or more sizes of silver rounds and silver bars. Each silver round or silver bar is guaranteed to contain its weight of pure .999 silver. What’s the catch? Well, the truth is, the silver rounds and silver bars in this Fine Silver Grab Bag may not be very pretty. The Fine Silver Grab Bag contains silver rounds and bars from the secondary market. This means they are not new. Some of the silver rounds or silver bars in the Fine Silver Grab Bag may be highly circulated, and some may show some significant signs of wear and tear, tarnish or milky spots. Since the value of silver is not affected by this, the Fine Silver Grab Bag is a great deal! You’ll get 100 ounces of .999 pure silver at an incredibly inexpensive silver price. Are you looking for great value in your silver purchases? Don’t care about perfect shine? Don’t need specific brand names on your silver bars and silver rounds? Then Kitco’s 100 oz .999 Fine Silver Grab Bag may be exactly what you are looking for. The specific contents of the 100 oz .999 Fine Silver Grab Bag will vary, depending on Kitco’s available inventory of silver rounds and silver bars. The silver bars and silver rounds in the Fine Silver Grab Bag are randomly selected. We cannot say exactly which silver rounds or silver bars will be in each Fine Silver Grab bag. The contents of each bag will be different, and may contain 1 oz silver rounds, 2 oz silver rounds, 1 oz silver bars, 5 oz Silver bars, 10 oz silver bars or a mixture of 2 or more sizes of silver rounds and silver bars. No matter what the combination of rounds and bars you find in your 100 oz .999 Fine Silver Grab Bag, each silver round or silver bar is guaranteed to contain 1 troy ounce of pure .999 silver. The Fine Silver Grab Bag is a canvas bag containing 100 oz of .999 silver. Looking for other ways to buy inexpensive silver? 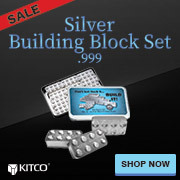 Kitco offers 100 oz silver bars at some of the lowest premiums in the industry. Kitco’s Junk Silver Bags are $100 Face Value Bags of pre-1965 Silver Coins. Take a look at all of Kitco’s pure silver bullion coins, silver bars and silver rounds on our Silver Bullion page. Don’t forget to check out our new and improved Gifts section for unique silver birthday presents and precious metals gift ideas in gold and silver, perfect for all occasions. Why buy Silver Grab Bags from Kitco? Kitco is the trusted leader in the precious metals industry. Pure .999 Silver Grab Bags and other precious metals sold by Kitco are recognized in bullion markets around the world. With our focus on silver bullion, you can benefit from Kitco's low silver prices and premiums that are highly competitive in the silver bullion industry. At Kitco, we make it easy for you to manage your wealth. You can sell silver and buy silver as well as other precious metals using our convenient online store, or by contacting our team of highly trained precious metals specialists. Backed by our global information network, Kitco has proudly served our customers since 1977. The 100 oz .999 Pure Silver Grab Bag(s) you receive will not be in mint condition. The 100 oz .999 Pure Silver Grab Bag(s) you receive will show minor signs of wear, handling and toning.